Agar is a gelling agent derived from algae. It is popular in Asian, vegetarian, and modernist cuisines as a meat-free gelatin alternative. 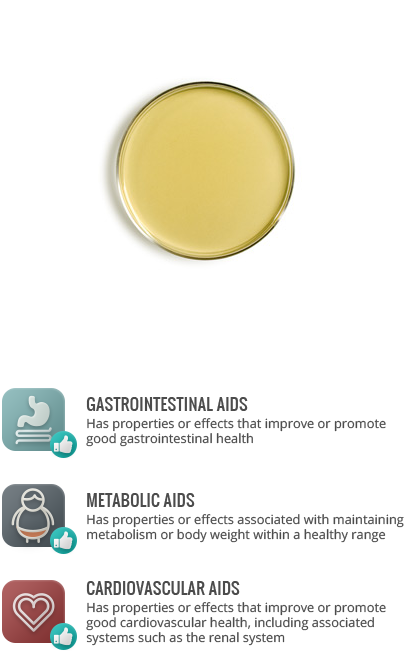 Agar is primarily fiber and has been used as a fiber supplement. It has been found to delay the speed with which food leaves the stomach, prolonging the sensation of fullness and possibly curbing appetite. In a study of obese, diabetic patients undergoing monitored weight loss, the group whose diet was supplemented with agar experienced significantly more weight loss and greater decreases in cholesterol. Agar’s high fiber content may cause constipation or have a laxative effect in individuals unaccustomed to high fiber intake, if consumed in large quantities.